October 10 2015. 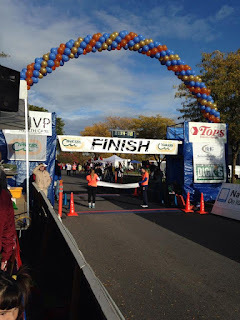 The weather in Syracuse NY this past Sunday was near perfect for long distance running, upper 40's/low 50's, overcast skies with no threat of rain and not too much wind. 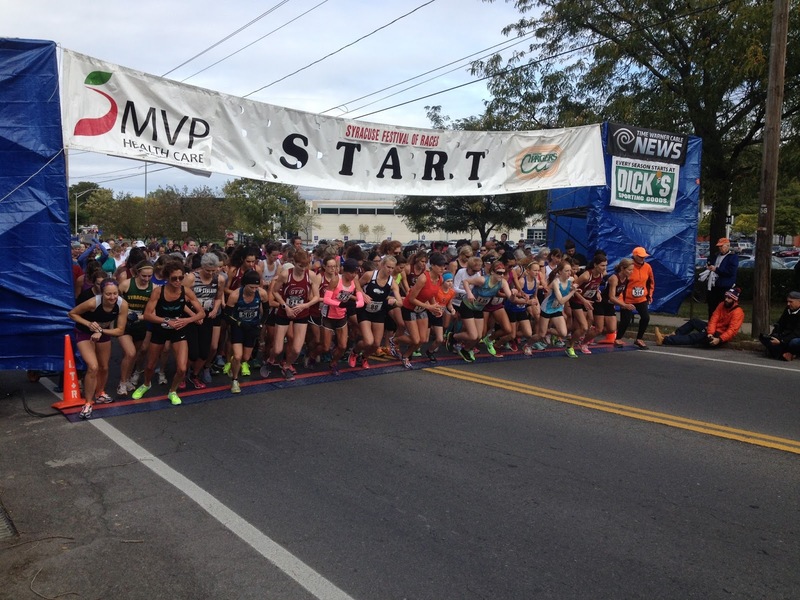 And 200 or so Elite Masters runners took advantage of the opportunity to race a fast 5K at this national championship. Enthusiastic spectators cheered on a terrific morning of races! Women. 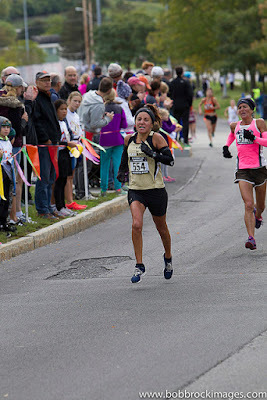 In my preview I had this as a race between Cassandra Henkiel (Austin TX), Renee Tolan (Clifton Park NY), Jennifer St. Jean (Darien CT), and Marisa Sutera Strange, with Michelle LaFleur (Savannah GA) another possible contender. Hurricane Joaquin had no direct effect on the race but its run up the coast kept some eastern seaboard runners at home, especially those with family responsibilities. Both St. Jean and LaFleur had to withdraw. We hope they have better luck next year and find their way to the championships. Karen Simmonds-Brady (Auburn NY) caught me by surprise; I had her just off the top group. Adding her and deleting LaFleur and St. Jean fom the list gives us the top 4 finishers. Henkiel is the USATF 8K champion from the February race in Brea CA and Strange is the USATF 10K champion from the April race in Dedham MA. As it turned out, it was not Henkiel's day as Simmonds-Brady, Strange, and Tolan sped away right from the start. By the halfway point it was the elder of the group, Strange, aged 52 who was pushing the pace, and the two 40-something youngsters were hanging on. Strange crossed the halfway mat in 8:46 with Tolan and Simmonds-Brady 4 seconds back. From there Strange was able to maintain the pace and surge to a dominating 22 second win in 17:38. Simmonds-Brady and Tolan had quite the battle for second, with Simmonds-Brady pulling away to take second by 3 seconds in 18 minutes flat. Henkiel gradually closed on the pair over the second half of the race but still came in 4th. Strange pocketed her second overall Masters Championship this year! 1st Strange 17:38; 2nd Simmonds-Brady 18:00; 3rd Tolan 18:03. Men. My preview featured Greg Mitchell (McMinville OR) as the defending champions and strong favorite, with Atlanta Track Club teammates, Alan Black Hillsboro GA), Kristian Blaich (Decatur GA), and Chad Newton (Pisgah Forest NC) in the hunt for 2nd and 3rd. Philippe Rolly (McLean VA) had the chance to break that group up if he had a stellar day. 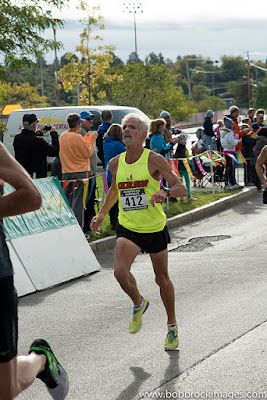 Mitchell left nothing to chance and left no doubt as to who was the fastest 5K masters runner on this day. He crossed the half way mat in 7:31, already 13 seconds ahead of Black. Black, in turn, had ten seconds on Newton and Blaich. Mitchell was gunning to better his 15:03 of last year but wasn't able to maintain the pace he needed, finishing in 15:08, half a minute clear of Black who finished second. Newton shaved a few seconds off of Black's halfway lead but was still 7 seconds back in 15:48. Blaich was three seconds back in fourth. Rolly rounded out the top five. 1st Mitchell 15:08; 2nd Black 15:41; 3rd Newton 15:48. 40-44. As you see from the overall recap, Simmonds-Brady and Tolan led the way for the 40-44 age group. Strange and Henkiel are not in this age group. That left the third spot on the podium wide open. Heather Webster (Honeoye Falls NY) was up to the task finishing 13 seconds behind Tolan for the bronze medal. 1st Simmonds-Brady 18:00; 2nd Tolan 18:03; 3rd Heather Webster 18:16. 45-49. Although not able to walk away with an open medal, Cassandra Henkiel had a better shot at the 45-49 gold medal. I picked her to win the age group by a wide margin, followed by Emily Bryans (Schenectady NY). I was unsure about whether to pick Audra Naujokas-Knapp or Laurie Wharton for third. In the end, I opted for Wharton, noting nonetheless that Naujokas-Knapp might have a tad more speed to tap into. If so, 3rd and 4th could be reversed. Henkiel blazed past the halfway point in 9:07, with Bryans right on her shoulder. Would there be an upset? No, Henkiel matched her 9:07 on the second half to finish with an even paced 18:14. Bryans was not able to keep up with her but came in at 18:27. At the same time in the race for 3rd, Naujokas-Knapp went out strong and built a 20 second lead over Wharton. And although Wharton tried valiantly, she was not able to close the gap as Naujokas-Knapp took the bronze medal in 20:10, with Wharton a half minute back in 4th. 50-54. Believe it or not, this was Strange's age group. 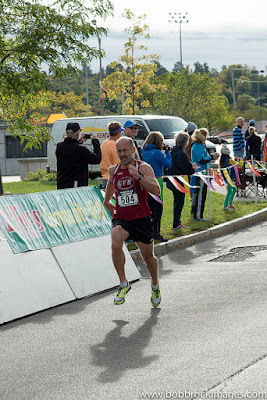 It is rarely possible for a 52 year old to beat out all of the 40-44 and 45-49 year old runners but that is what happened. So clearly Strange picked up the age group win as well. But what of 2nd and 3rd? 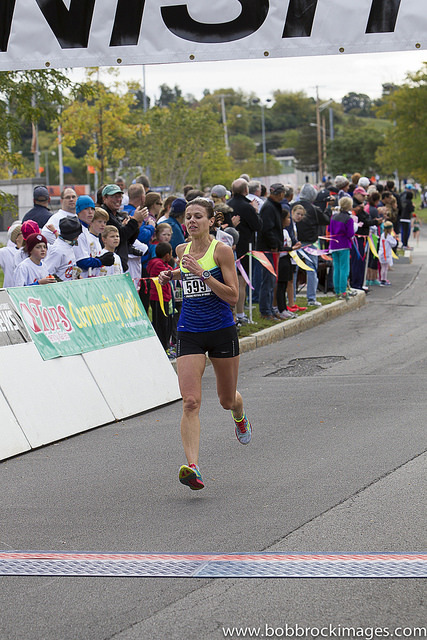 In a race with many strong runners, I picked Karyl Sargent (Lafayette NY) and Julie Pangburn (Malvern PA) for 2nd and 3rd. But I noted that any one of several runners could upset my predictions applecart. These included: Carol Bischoff (Macedon NY), Lorraine Jasper (Birchrunville PA), Kerry Monahan (River Vale NJ), Betsy Stewart (West Chester PA), and Mary Swan (Penn Valley PA). All of this talent in one race led to the closest finish of the day for 2nd and 3rd. Jasper and Sargent went out strong, hitting the halfway point in 9:53 and 9:55. Sargent had just a little more closing power, however, as she finished off with a 10:02 second half to claim 2nd in 19:57 to Jasper's 19:58! Bischoff, Monahan, Stewart and Swan all broke 22 minutes. 1st Strange 17:38; 2nd Sargent 19:57; 3rd Jasper 19:58. 55-59. 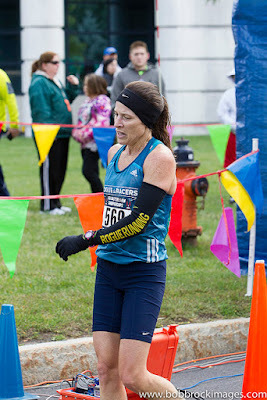 The pre-race favorite was Hall-of-Famer Carmen Ayala-Troncoso (Austin TX). I picked Elizabeth Besio (Camillus NY) and Cynthia Williams (Acworth GA) for 2nd and 3rd. It looked like Marie White (Henrietta NY) and Dianna Hinton (Waleska GA) would be left on the outside looking in. Ayala-Troncoso lived up to her reputation, covering the first half of the race in 9:24 and finishing at 19:14 to win the race by well over 2 minutes. In the race for 2nd, I overlooked Colleen Magnussen (Geneseo NY) and Elizabeth Besio, whom I picked, was not in the race. Magnussen ran a fast 10:45 for the first half of the race, opening up a 19 second gap over Williams. Although the pace slowed somewhat over the second half of the race, the gap widened. Magnussen ran over a minute faster than last year to claim 2nd by 32 seconds over Williams in 3rd. 60-64. This group also had a strong favorite. 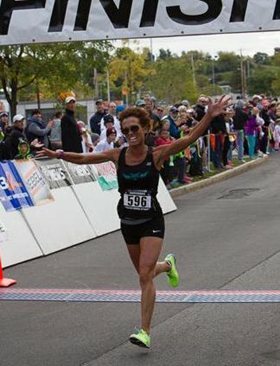 A late entrant, Hall-of-Famer and 2013 Masters Runner of the Year, Kathy Martin (Northport NY) was predicted to win by a wide margin. Last year's winner and runner-up Corinne Steinbach (Pompey NY)and Sharon Moore (Rochester NY) were predicted to finish in that order behind Martin, except that I had them in 3rd and 4th behind Margaret Taylor (Atlanta GA). Martin, as expected, ran away with the age group crown, crossing the halfway mat in 9:31 and finishing in 19:24 to win by well over 2 minutes. On this day Taylor was no competition for Steinbach and Moore however. Moore went over the halfway mat in 10:49 with Steinbach 5 seconds back and Taylor almost a half minute back. Steinbach was able to catch Moore, however, and pulled away towards the end for a 3 second margin. 1st Martin 19:24; 2nd Steinbach 22:01; 3rd Moore 22:04. 65-69. Edie Stevenson (Boulder CO) was a strong pre-race favorite, with Erika Campbell (Ridgewood NJ) picked to finish 2nd. Lynda McGuire (Scottsville NY), who finished 3rd last year, was picked to repeat.Stevenson ran a pretty even pace, crossing the halfway mat in 10:44, with Campbell 24 seconds back and coming home in 10:50 for a 60 second margin of victory. McGuire and Cande Olsen (Chatham NY) had quite a contest for 3rd. McGuire went out in 12:30 with Olsen 12 seconds back. But Olsen caught up and then pulled away over the 2nd half of the race to claim 3rd place. 1st Stevenson 21:34; 2nd Campbell 22:34; 3rd Olsen 25:30. 70-74. 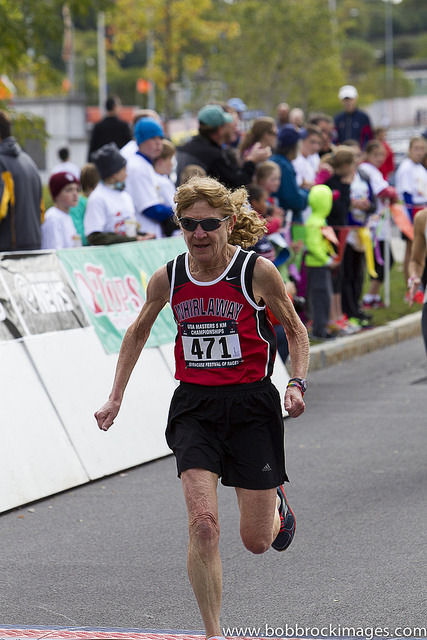 Jan Holmquist (Burlington MA), the American record holder for the 5K for this age group was, not surprisingly, the favorite. The only question was whether she could lower the 22:16 record she set on this course in 2014. Sue Gardinier (Verona NY), last year's bronze medalist, and Mac Mackenzie (Jamestown NY) were picked for 2nd and 3rd. Holmquist covered the first half of the course in 11:14 so a record looked unlikely; in 2014 she crossed the halfway mat in 10:59. But looks are soemtimes deceiving and that was the case here as Holmquist ran a classic negative split, surging to an 11:00 time for the second half of the course and a new record of 22:15! Gardinier delivered the predicted 2nd place in 27:48 with Mackenzie on course for 3rd three minutes back. 1st Holmquist 22:15 (US Age Group Record); 2nd Gardinier 27:48; 3rd Mackenzie 30:40. 75-79. Madeline Bost (Randolph NJ), 2nd last year to living legend Libby James, looked to move up to 1st this year. But that would occur only if she could hold off the youngsters, Fran Rowe (Niagara Falls NY) and Estelle Hahn (Jamesville NY), who moved up from the 70-74 group to challenge for the win. Bost was on her game though, charging out to a 16:51, opening up a 30 second gap over Hahn, with Rowe another 6 seconds back. Bost came home smartly for the gold medal over a minute ahead of Hahn who took silver. 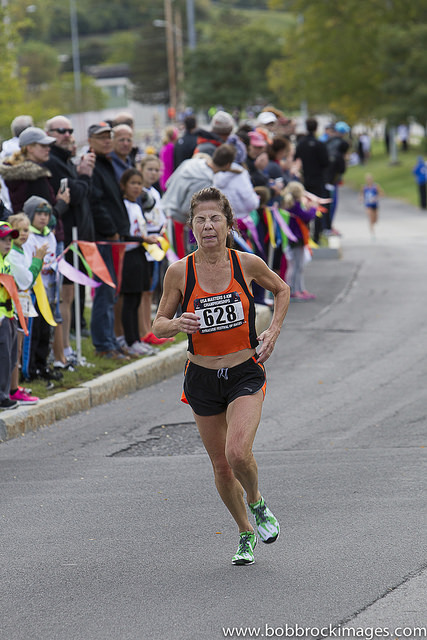 Susan Hansen (E. Syracuse NY) had a strong 2nd half as she not only caught Rowe from 18 seconds back, but surged ahead to take 3rd by about 10 seconds. 1st Bost 34:18; Hahn 35:37; Hansen 35:53. 80-84. 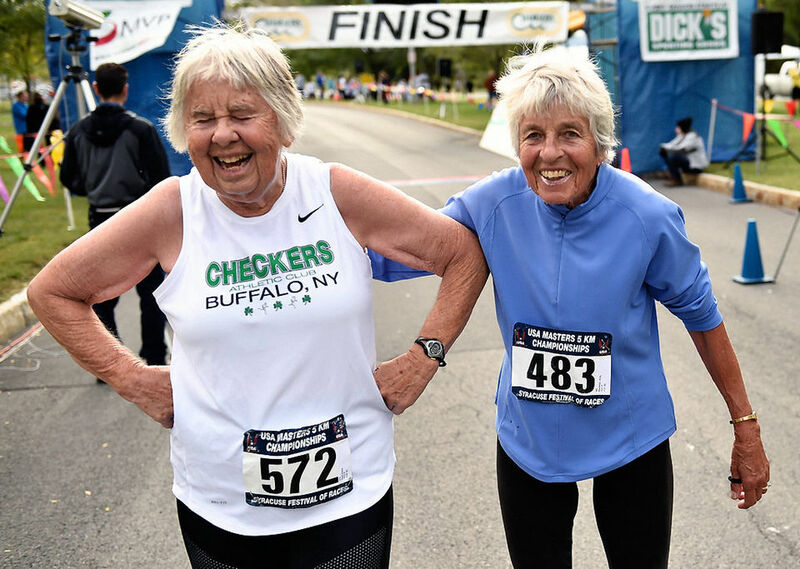 I guessed that Anny Stockman (Rensselaer NY) would successfully defend her gold medal with Edna Hyer (South Wales NY) taking the silver, and that's how it turned out for these running friends. 40-44. This group was a replay of the Overall race detailed above except that Newton and Blaich are from the M45 group so Philippe Rolly rolls into 3rd behind Greg Mitchell and Alan Black. 1st Mitchell 15:08; 2nd Black 15:41; Rolly 16:10. 45-49. The first two prizes go to Chad Newton and Kristian Blaich who finished 3rd and 4th overall. I had picked their Atlanta TC teammate, Matthew Whitis, for 3rd if he could hold off David Atkinson (Grand Blanc MI). Atkinson was, indeed, a tough challenger as was Tim Van Orden (Brattleboro VT) who snuck in under my radar. Van Orden went through the halfway mark in 8:09 with Atkinson only 4 seconds back. Whitis, coming though 13 seconds back, had to count on both fading a bit. In the end, neither did.Whitis ran a very even paced race but it was not enough as Van Orden held both off to take the bronze medal by ten seconds over Atkinson. 1st Newton 15:48; Blaich 15:51; Van Orden 16:27. 50-54. This group appeared it would be tightly contested. In my preview I mentioned 8 racers who were in contention. 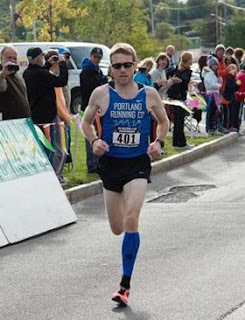 In the end, I picked a newcomer to the group up from M45, Brian Crowley (Hillsborough NJ) to win it, followed by last year's winner, Mark Zamek (Allentown PA), and Nat Larson (Amherst MA), who finished 3rd in the 10K national championship this year. Other contenders mentioned included Daniel Dixon ((Jackson MI)) Alan Evans ((Beaver Dams NY) Ruben Henderson (Grand Rapids MI), and Mike Nier (Rochester NY). But it was Larson's day, not Crowley's. Larson took off like a shot, running with the overall contenders and crossing the halfway point in 8:03--that's smoking. In fact, because he is not well known yet among elite Masters runners and because he was so far ahead, the other contenders were unaware of him until after the race. At the halfway mat, Nier was already 8 seconds back, with Henderson another 8 seconds behind him. Dixon and Evans were slugging it out at 8:27. Larson brought it home for a terrific 16:10 time, beating Nier by almost 30 seconds. Nier ran strong, however, holding off a fast closing Dixon to claim 2nd by 12 seconds. Dixon took 3rd with Henderson a few seconds back in 4th. 1st Larson 16:10; 2nd Nier 16:39; 3rd Dixon 16:51. 55-59. Once I learned that Brian Pilcher (Ross CA) was out with a blown hamstring, I picked last year's winner, Ken Youngers (Tucker GA), to repeat, while being pressed by Dave Bussard (Elkhart IN) and Derrick Staley (Ballston Lake NY). I learned, after the race, that Youngers was recovering from a hamstring setback as well. As a result, he ran almost a minute slower than last year and was never in contention. Bussard went out strong, maybe too strong, crossing the halfway mat in a very swift 8:14. Staley was 12 seconds back at this point, with Charlie Andrews (Rochester NY) another 4 seconds to the rear. Staley's steady pace over the 2nd half of the race chipped 9 seconds off of Bussard's lead but in the end Bussard had 4 seconds to spare as he claimed the gold medal in 16:55. Staley took the silver and Andrews the bronze, 18 seconds further back. 1st Bussard 16:55; 2nd Staley 16:59; 3rd Andrews 17:17. 60-64. This group had the most entrants of any age group. 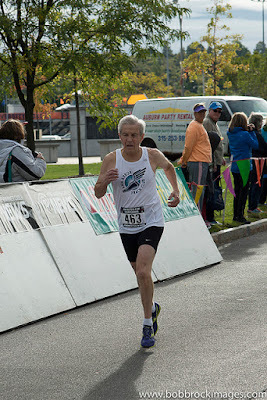 Last year's winner and the American 5K record holder for this age group, Tom McCormack, continues to struggle with injuries. 2014 belonged to the fleet Irish ex-pat from the hills of East Tennessee, but in his absence another Tom, Tom Bernhard (Castro Valley CA) has risen to the top of this group. In a group with so many fine runners it is tough to pick favorites. In the end I picked Bernhard to win followed by Reno Stirrat (Rockaway NJ), who had a fine summer of racing, and then the recent Hall-of-Fame inductee, Doug Bell (Greeley CO). I also mentioned Bell's teammate, John Victoria (Colorado Springs CO), as a possible spoiler. I failed to mention Mark Rybinski (Manlius NY) but that was an oversight, especially considering he was moving up from the M55 group. Little did the others know it but Bernhard was planning on a negative split. Nonetheless he crossed the halfway mat in 8:50, with Victoria right on his shoulder. Bell was 4 seconds back with Stirrat 4 seconds further back. Rybinski appeared to be out of it, another 9 seconds back from Stirrat. Bernhard steadily pulled away over the 2nd half, covering it in 8:46. Could Victoria, Bell and Stirat hold on after going out perhaps a bit too fast? Victoria managed a 9:11 over the 2nd half and that was enough to secure the silver medal. The race for the bronze was a doozy as Stirrat had just enough left in the tank to hold off a hard-charging Rybinski be no more than a second. What a finish! 1st Bernhard 17:36; 2nd Victoria 18:03; Stirrat 18:27. 65-69. In my preview I picked Lloyd Hansen (Salt Lake City UT) to defend his 2014 title, followed by Bob Giambalvo (Delhi NY), and Vasan Neovakul (Atlanta GA). I knew that Doc Rappole (Bemus NY) would ordinarily be a top contender but also deduced that he had sustained an injury in the CRIM 10 mile run in late August. I thought he would not be recovered enough to be in contention. What I learned the morning of the race is that Bill Dixon (Brattleboro VT), a top Masters runner and the 2013 winner of this race was a late entry. Had I known, he would certainly have been my pick to repeat his 2013 victory over Hansen. I had picked Hansen to win despite knowing that his form is a little off what it was last year when he won so many national championships. As it turned out, Giambalvo was a no show, possibly due to Hurricane Joaquin. Hansen gave it his all as he always does but Dixon was incredibly strong. Dixon hit the halfway mat in 9:07 with Hansen 13 seconds back. Although struggling with his fitness, Rappole nonetheless hit the half in 3rd place, 9 seconds ahead of Bill Bosmann (Rockaway NJ). Dixon and Hansen both ran strong 2nd halves winding up with gold and silver respectively. Bosmann nearly caught up with Rappole but the New Yorker was able to hold him off to claim the bronze by 5 seconds. 1st Dixon 18:33; 2nd Hansen 18:59; 3rd Rappole 20:13. 70-74. 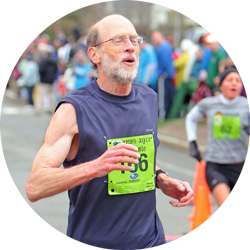 Billed as a possible battle between perennial age group Runner of the Year, Doug Goodhue (Milford MI) and many times over national champion, Jan Frisby (Grand Junction CO). A banged up knee kept Goodhue out of races over the first half of the year and Frisby enjoyed his absence, racking up 4 national championships and cracking the 70-74 10K record in the Marin County 10K in California. Goodhue gradually recovered over the spring and summer and they had met at the CRIM Festival of Races in August where Goodhue took the USATF 1 mile crown. But this would be their first meeting of the year at one of the standard distances. Goodhue appeared to be close to his full fitness; Frisby was, in his own words, a little nicked up. For 3rd place I picked Morris Williams (Highlands NC) on the basis of his placing at the USATF 1 Mile Road Race. But that may have been a mistake. At least on this day, Williams was not competitive in the 5K. I also mentioned Przemyslaw Nowicki (Holmdel NJ) and Joe Carter (Snellville GA) as possible contenders and there I was closer to the mark. As he always does when fit, Goodhue took it out hard, hitting the halfway mark in 9:42, right on pace for a 19:24! Frisby went through in 9:57 which was plenty fast enough but right after that, in his own words, "my Achilles tore loose!' That put him out of contention but not out of the race; Frisby gamely kept on and finished in 26 minutes and change. 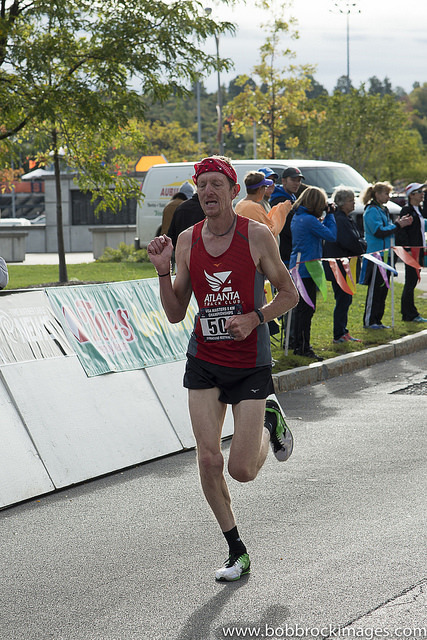 The 3rd runner across the halfway mat, Nowicki, in 10:23 moved up to 2nd place, with Rick Stetson (Duxbury MA) next. Goodhue eased in to his gold medal with over a minute to spare and Nowicki took the silver by over a minute as well. I look forward to Goodhue and Frisby going at it again next year, with the hope that both are at or near full fitness. 1st Goodhue 20:07; 2nd Nowicki 21:15; 3rd Stetson 22:30. 75-79. Until John Elliott (NY, NY) had to bow out due to family responsibilities in the threat of Hurricane Joaquin, he was the favorite. In his absence I guessed that Roland Cormier (Jackson NJ), Ron Mastin (Woodstock GA), and Matt Lalumia (Clifton NJ) would vie for the title. Cormier got out the fastest, crossing the halfway point in 11:44 with Mastin only 8 seconds back. Lalumia did not have his best day and was more than a minute off the pace in 13;!2. An overlooked runner, Thom Weddle (Excelsior MN), was only a half minute back from Cormier in 12:16.Mastin passed Cormier shortly after the halfway mark and pulled away to win in 23:15 (23:07 net). Cormier took 2nd in 23:59 with Weddle getting the bronze medal in 26:13. Lalumia had to settle for 4th this year. 1st Mastin 23:15; 2nd Cormier 23:59; 3rd Weddle 26:15. 80-84. I picked John Harper (Seal Beach CA) to successfully defend his title, with Wade Stockman (Rensselaer NY) in 2nd and Fritz Schlereth (Syracuse NY) in 3rd. Harper was not able to race after all. Stockman won the gold medal easily while Schlereth claimed the silver. 85+. Willis Moses (Vestal NY) had the distinction, again this year, of being the race's oldest gold medal winner. Women. 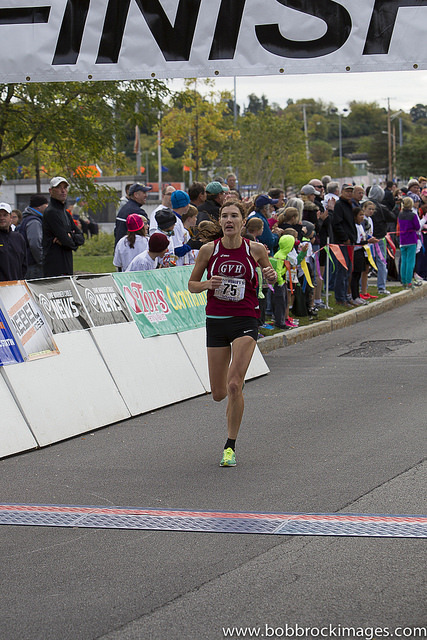 The Genesee Valley Harriers (NY) were the hometown heroines for this event, taking two firsts and a third. 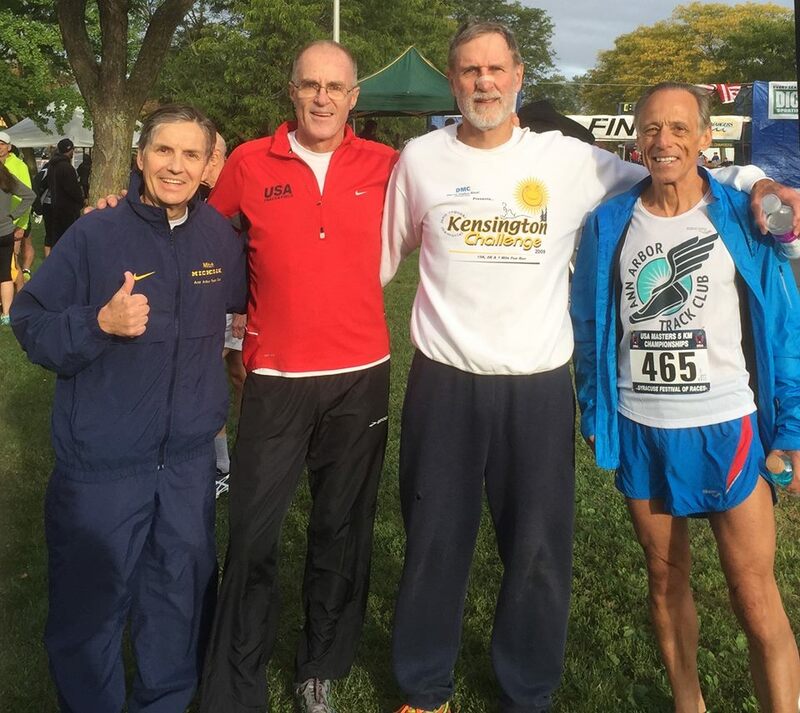 GVH dominated in the 40+ and 60+ team categories while the Athena Track Club (southeastern Pennsylvania) were equally dominant in the 50+ race. There was one close team race for a bronze medal. In the 40+ race, the GVH-B team had their first two runners, Wakenda Tyler and Michelle Hays, in with a combined time of 42:01 while the Atlanta Track Club had their first two runners, Laurie Wharton and Susan Welch come in with a total time of 42:08! With only 7 seconds between the teams it came down to their 3rd runner in. Who would it be? GVH-B's Colleen Daggs outkicked ATC's Cynthia Williams 22:32 to 22:33. You do not get much closer than that! 40+: GVH-A (Simmonds-Brady, Webster, Senall, Naujokas-Knapp) 55:24; Syracuse Track Club (White, Sargent, Wheeler) 61:59; GVH-B (Tyler, Hays, Daggs) 64:33. 50+: Athena Track Club-A (Strange, Jasper, Pangburn) 58:27; Athena Track Club-B (Swan, Stewart, Steinbach) 64:14; GVH (Bischoff, Magnussen, Gordon) 65:22. 60+: GVH (Moore, Ingalls, Herrick) 70:44; Shore AC (Stirrat, Bell, Cormier) 1:32:43. 70+: Checkers AC (MacKenzie, Rowe, Hyer) 1:45:07. Men. This year there was a different team winner for each age group. The Atlanta Track Club, Playmakers Elite/New Balance (MI), the Boulder Road Runners, and Ann Arbor Track Club were the winning teams. ATC had the best overall outcomes with a first and two 3rd place finishes, followed by Shore AC (NJ) with two seconds and GVH with a 2nd and a 3rd. Of course if you weighted it by distanced traveled to get to the race, Boulder would move up! Thanks for coming east, guys! The only close race for first was in the 50+ division, between Playmakers Elite and GVH. Mike Niers set the pace for GVH but the Playmakers Elite held together as a tighter group of runners. That gave them the victory by 34 seconds. Nier came across the line in 16:39 but 12 seconds later the Playmakers parade of Daniel Dixon, Ruben Henderson, and Dave Bussard came across the line within 4 seconds of each other. How's that for pack running?! 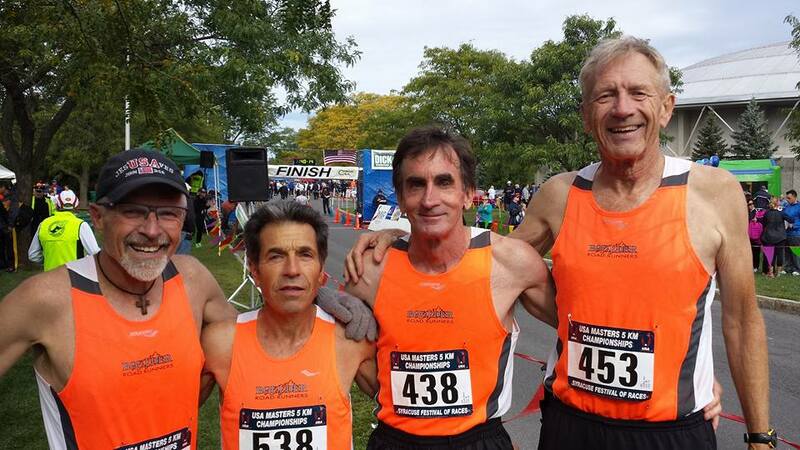 The two tightest races of the day were the race for the team silver in the 60+ and 70+ divisions. Shore AC's 60+ team of Stirrat, Gaughan and Chiusano was a cumulative 6 seconds ahead of GVH's Rybinski, Gioia, and Beyerbach at the halfway point. It was anybody's race! When Stirrat and Rybinski finished within a second of each other, it could still go either way! Shore's 2nd and 3rd runners were together at the halfway mark and within a second of each other at the finish and a few seconds ahead of GVH's 2nd and 3rd. That's all it took to deliver the 20 second victory. The 70+ race for silver was even closer with only a 17 second margin at the end. At the halfway mark, Shore AC appeared to have things in hand with a 40 second lead over the Atlanta Track Club. Most of that was due to the lead runner, Przemyslaw Nowicki, but it helped that their 2nd and 3rd runners, J.L. Seymore and Roland Cormier were running together within 3 seconds of each other. But the ATC threatened to reverse the outcome. 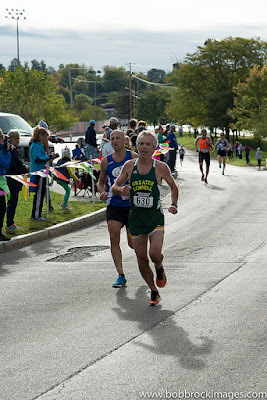 Their 3rd runner at the halfway point, Ron Mastin ran a negative split, closed with their 2nd runner at the half, Frank White, and they came in together, only 16 seconds behind their leader, Joe Carter. But Seymore and Cormier kept on chugging, arriving at the finish line within 2 seconds of one another. Had either one got dropped, the silver would have gone to ATC. But as it turned out, Shore AC had their 2nd silver of the contest. 40+: ATC (Black, Newton, Blaich, Whitis) 47:20; Garmin Runners [NJ] (Williams, Rosenberg, Crowley, Garrell, Bosmann) 50:26; Willow Street AC [NY] (Burkowski, Staley, Stadtlander, Irwin) 51:39. 50+: Playmakers Elite/New Balance (Dixon, Henderson, Bussard, Zywicki) 50:40; GVH (Nier, Evans, Flanders, Johnston, Schnaufer) 51:14; ATC (Droze, Youngers, Dundas, Skipper) 52:15. 60+: Boulder Road Runners (Victoria, Bell, Croft, Frisby) 16:55; Shore AC (Stirrat, Gaughan, Chiusano, Trengove, Nolan) 57:28; GVH (Rybinski, Gioia, Beyerbach, McMullen, Rappole) 57:48. 70+: Ann Arbor TC (Goodhue, Piliawsky, Herrala, Cohen, Weddle) 67:34; Shore AC (Nowicki, Seymore, Cormier, Kuhi) 69:11; ATC (Carter, Mastin and White, Bligh, Williams) 69:28. Women-- 40+--GVH-A 67 second spread from 1 to 3 (Simmonds-Brady, Webster, Senall); Athena TC-B 79 seconds (Swan, Stewart, Steinbach); 40+ ATC 112 seconds (Wharton, Welch, Williams). Men-- 40+ TNT International and 50+ Playmakers Elite/New Balance--4 second spread from 1 to 3 for TNT (Lanier, Lanier, Jackson) and Playmakers (Dixon, Henderson, Bussard); 40+ ATC 10 seconds (Black, Newton, Blaich). 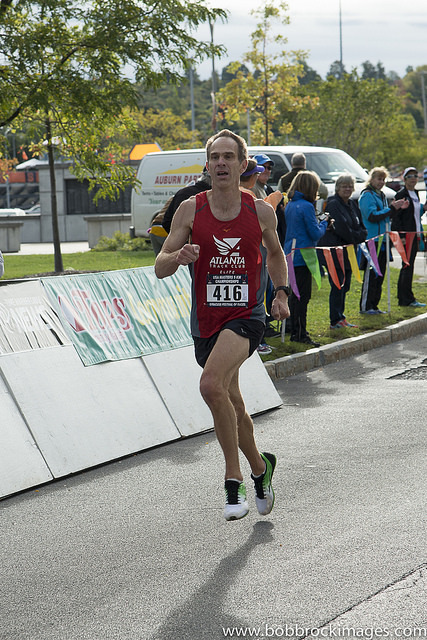 Congratulations one and all for another fine day of racing in Syracuse at the Festival of Races, the 2015 USATF 5K National Masters Championships!